My longtime crush on Nigel Slater stems from the first time I laid eyes on his book Tender: A Cook and His Vegetable Patch. The thick, almost homely tome lay on a bookshelf in a local store, and somehow seduced me with one sidelong glance. On the cover beautiful young pole beans were gathered in a loose pile on a kitchen tea towel and blanketed with a simple but alluring title- just sort of tucking them in. I was instantly smitten. Since that day I have cooked from those trusty recipes inside again and again, and thumbed through the accounts of planting times and harvest yields preceding each vegetable’s recipes countless times – as only the urbanite wistfully hiding a rural past does. I grew up in the foothills of Northern California, in a forested community boasting only a couple hundred settlers, many of them trying to live “off the grid”. Here among the ferns, oaks, and cedars, my parents instilled an early love of gardening in my siblings and I, allotting each of us a raised bed for growing whatever we fancied from the big box they kept full of little paper seed packets. My seed choices were often of the sweet and spicy variety, like peas and radishes, strawberries and carrots. I distinctly remember the excitement of watching seedlings sprout in their little indoor trays, before it was warm enough to plant them right in the red clay ground. The garden was sprawling and overgrown in areas, making it necessary to leap over the Sweet Williams to reach the hose nozzle, and weave around the groping tendrils of cucumbers leaning off of their trellises to get to the strawberries. Yet, the garden was a safe space and a sanctuary, with a bean tent meant for imagining fairy encounters, and always enough blackberries, nasturtiums, broccoli and cherry tomatoes to snack on during the torturous wait between lunch and dinner. College found me moving to the Bay Area to attend UC Berkeley. Through all my excitement and ambition, I never outgrew the need for green growing things, the need to smell damp earth and eat sun-warmed tomatoes straight off the vine. Somehow Nigel managed to comfort and reassure me in the adjustment to living in the ever-awake, always impatient, incessantly moving Bay Area. He seemed to say, you can live in a city and keep to the pace of your woodsy heart. This recipe speaks to the soul of my cooking and the core of Nigel’s philosophy. Simple ingredients, seasonally chosen and generously unspecific in their amounts are just right for February, for soup, and for warming city-weary bones. The ingredients sing of woodsiness, rusticity, and comfort. I adapted Nigel’s recipe to swap out the rib of celery for another seasonal vegetable that I love, celeriac. Not only did it flavor the soup with a subtler but deeper flavor than a celery stalk, but its wonderful almost-starchy quality lent a comforting layer of creaminess to the final dish. For the porcini-laden toasts, I used a whole-grain German bread from Maria Speck’s Ancient Grains for Modern Meals, a wonderful whole-grain resource. This bread is more than interesting, it is exquisite. I heartily suggest you invest in a seedy rye or other whole-grain toast. Soak the porcini in about 1 1/4 cups of warm water (300 ml) for thirty minutes. Peel the onions, chop them coarsely; and put in a heavy-bottomed pan with the oil and butter. Cook until soft and translucent, stirring regularly. Peel the parsnips and cut them into large chunks (if using celeriac, cut into same-sized chunks). Add them (parsnips and celeriac) to the pan and let them color lightly on all sides. This will take seven to ten minutes, occasionally stirring. Pour in the stock, then add the celery (if using), garlic, porcinis and their soaking water. Season with salt and pepper and bring to a boil. Decrease heat to simmer merrily for about forty minutes. Meanwhile, make the toasts. Soak the porcini in warm water for half an hour, then squeeze dry and mince along with the parsley and garlic. Throw in the walnuts and chp a bit more. Melt the butter in a small pan, tip in the porcini mixture and sautée until warm and fragrant. Purée the soup until smooth, either with an immersion blender or by transferring ladlefuls to a standing blender. Spoon the sautéed porcini, walnuts, garlic and parsley onto toasts and float them in individual bowls of soup. I am, without a doubt, a morning person. I cannot drink in enough of the light, of the solemn quiet of my sleepy neighborhood, and the promise of the day almost tangible in the fresh early air. And then of course, morning translates pretty fluidly into the best meal of the three – breakfast – which around here means whole grains. Oats, buckwheat, millet, grits, barley, red winter wheat. No food speaks more strongly to me of nostalgia, of home, and of comfort than grains. You could measure my childhood breakfasts in from-scratch pancakes, biscuits, muffins and just-out-of-the-oven loaves of bread. Growing up in the mountains out of town meant rising at 5:30 am on weekday mornings to catch the bus that would take me and my siblings down to the valley and school an hour later. Somehow my mother could whip up a batch of almost any baked good in the half-hour it took to get us out of bed and stumbling into the shower, so that another half-hour later we were sitting down to fragrant apple muffins, or a double batch of sturdy whole-wheat pancakes – for breakfast AND lunch (we didn’t mind). Perhaps our favorite were her biscuits, always made with whole milk and butter, and so tender that you’d split the top and bottom apart using careful fingertips, to slip a pat of butter inside (for a little extra fortitude) and shut it quick, so as not to let its steam escape. Although she always offers to make them, these days my mother can’t share a stack of whole-wheat pancakes or her classic biscuits with me, having discovered a wheat-allergy last year. So instead she and I tinker with gluten-free alternatives that have been known to fail spectacularly (i.e. when my beautiful raspberry scone dough morphed into something in the oven which we now affectionately refer to as “Raspberry Rubber”. My family, kind souls that they are, valiantly ate them all). 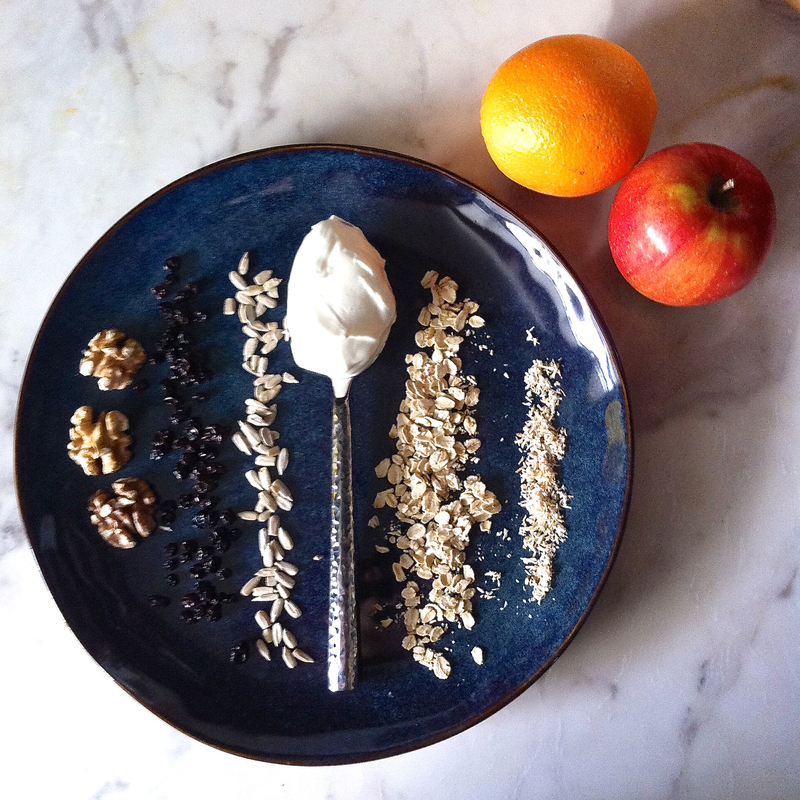 One of the best breakfasts we’ve eaten together lately is an amazing, naturally gluten-free muesli, a recipe from Noelle of xo breakfast (who adapted it from Saveur). I was introduced to Noelle’s blog by a close friend in 2010, and as you’ve probably already guessed, I fell immediately in love with it – from her delightfully casual but sophisticated tone to the blog’s little heart-shaped-egg emblem. 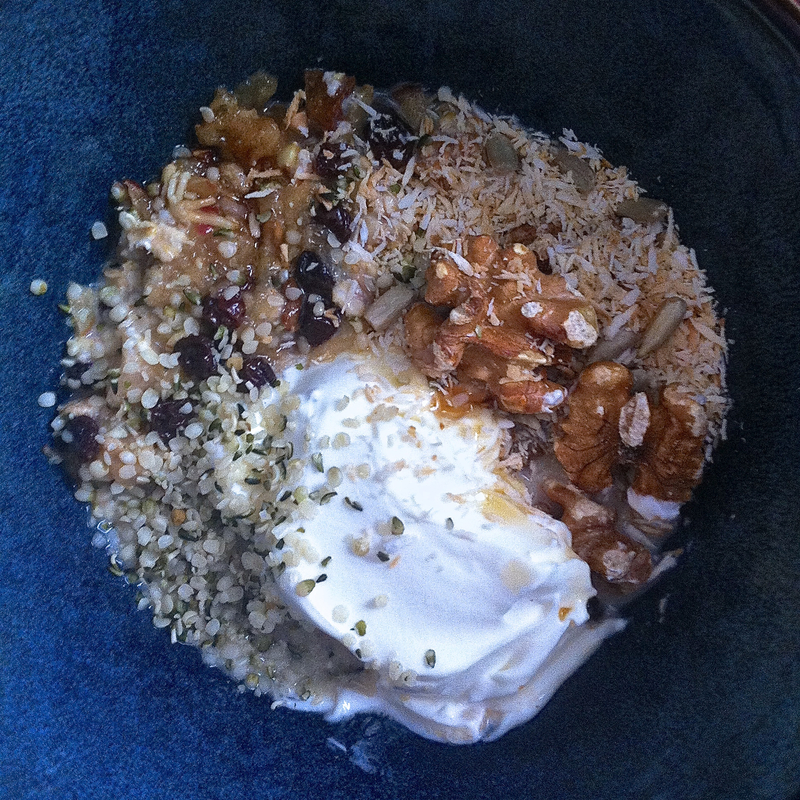 I still make a batch of her muesli at least once a month, and more often in ridiculous weather like we are having now, when the 72˚F average means nothing’s so welcome as a chilled bowl of muesli. 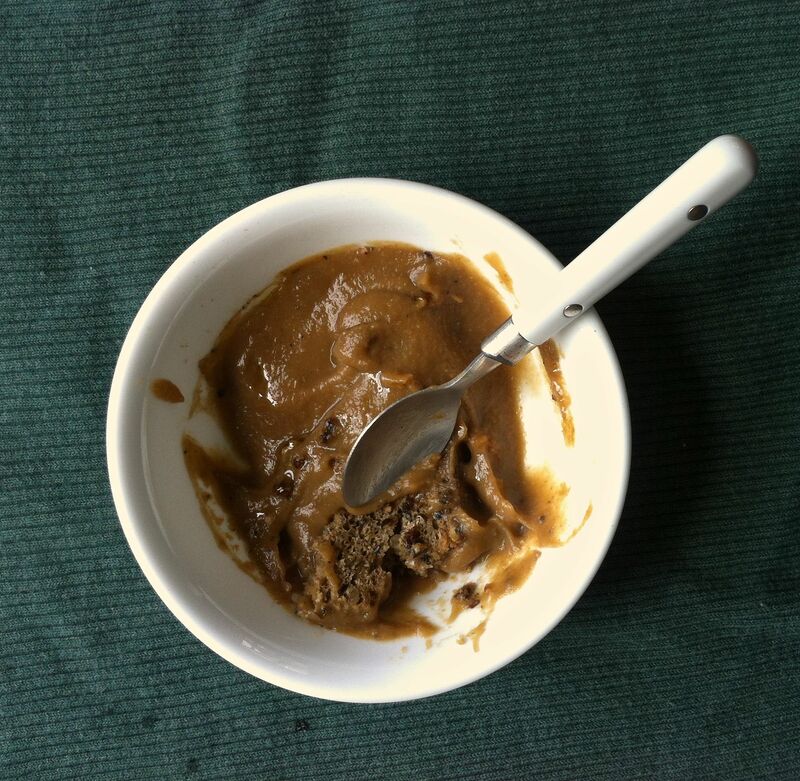 The ingredient list can and should be sung to the tune of “My Favorite Things” (Toast-ed nuts, coc-onut, orange-boost-ed rais-ins, Spoon-fuls of yo-gurt with ap-ple and rolled oats), and singing or no singing, the finished result is an absolute pleasure to eat. If I am being particularly smart, I remember to soak the grains in water for at least 8 hours before draining them and adding milk and vanilla (you know – digestability and all that). But I often settle for the original recipe’s single soak because, well, one must live a little right? Regardless, this is just the breakfast for the Bay Area summer heat that’s hit 4 months too soon. 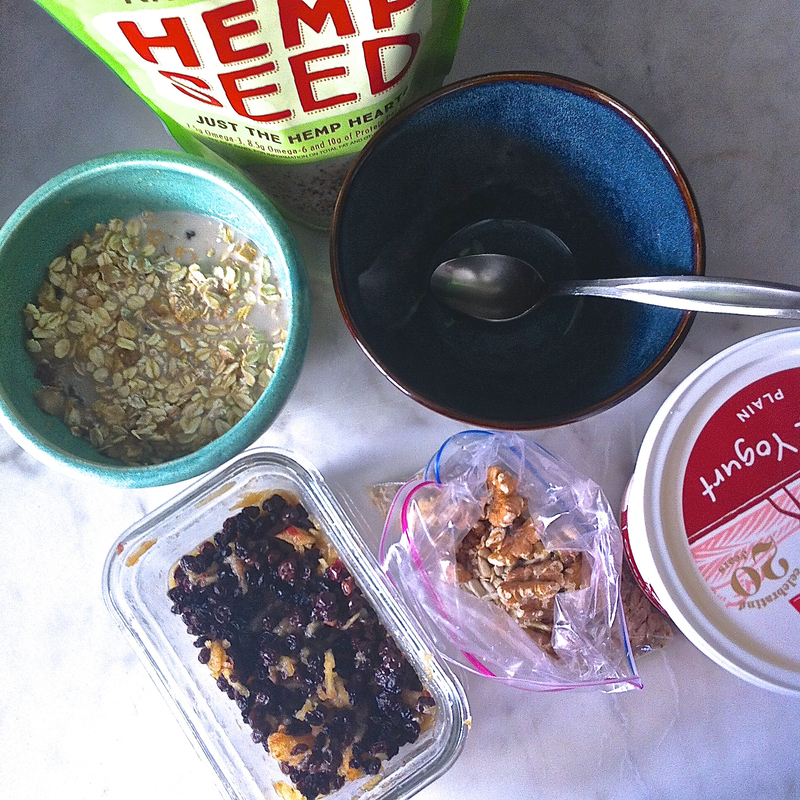 optional: more things you’d sprinkle into granola or oatmeal: i.e. hemp seeds (my favorite), pistachios, or flax seeds. The day before, soak the oats in water for a few hours. Then drain oats and combine with the milk in a large sealable container or bowl. Add the vanilla and the salt, and stir. Cover and refrigerate. In another container, squeeze the orange into the raisins. Cover and refrigerate. Toast the walnuts at 350ºF for 8-10 minutes. Toast the coconut and sunflower seeds for 2-4 minutes. While they are toasting, pit and chop the prunes. Chop the walnuts if you like. Mix nuts and prunes together in a bowl and cover. The next morning, add the raisin mixture to the oats. Core and grate the apple into the mix, dollop with a generous scoop of yogurt and sprinkle the nuts, prunes, and coconut on top. Stir everything up and taste. Drizzle with honey if more sweetness is needed. 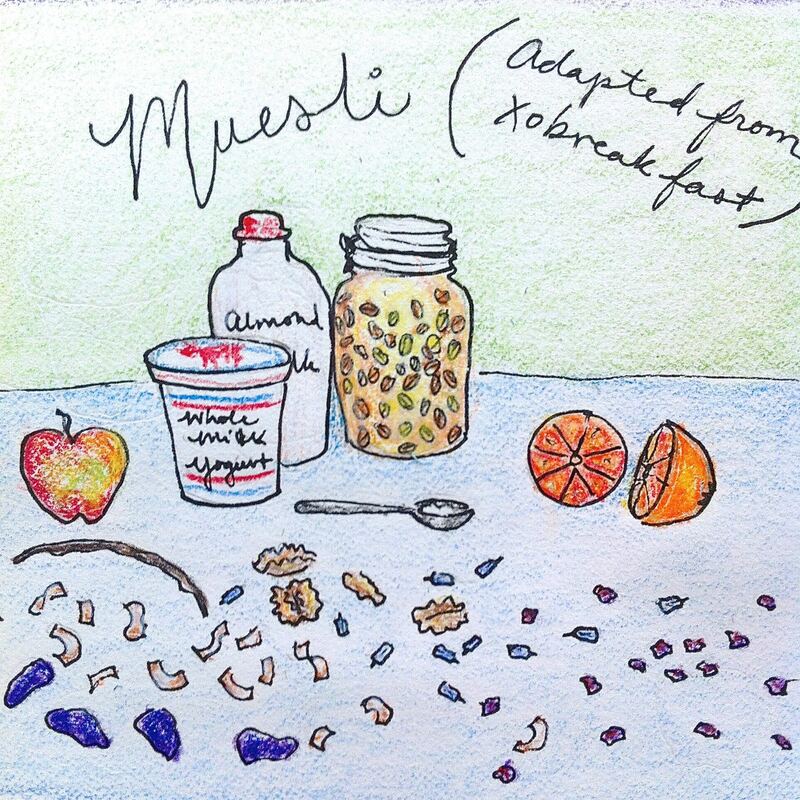 Save the rest of the muesli components for the next day, and the next, and the next! A glimpse of Saturday’s send-off: a perfectly warm afternoon featuring good hugs, good snacks, and a punch bowl full of negroni. We are very lucky to have such a wonderful community of people cheering us on to the next big (New York-sized) adventure.